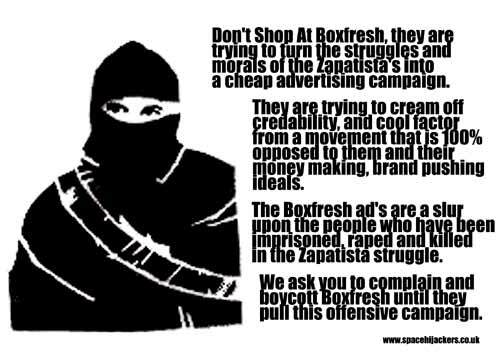 After both a graffiti campaign and the email and internet campaign, we decided that it was time for some Hijacking, so dressing up in true Zapatista style, we donned our balaclavas and headed to Boxfresh. 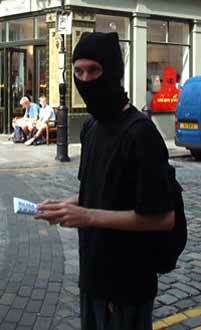 We managed to handout 200 leaflets to Covent Garden Shoppers and anyone congregating around the Boxfresh store. 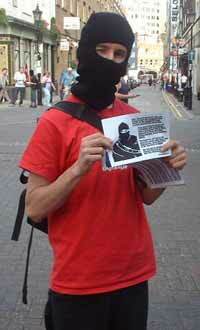 The leaflet contained an explination of what our protest was about, what we thought Boxfresh was wrong in doing, and most importantly a history of the Zapatista struggle and an explination of who they are and why they should be admired, not turned into an ad campaign.